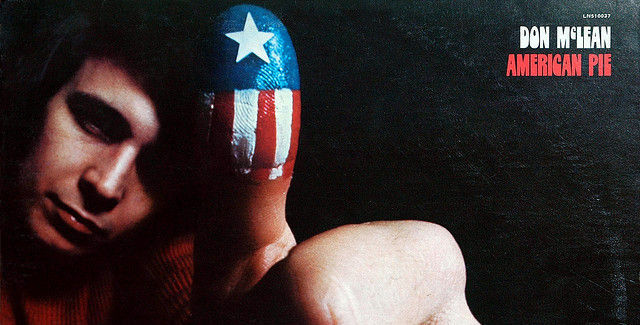 One of the iconic rock and roll songs of the 1970's was American Pie by Don McLean. In 1972 it was a number hit in America for four consecutive weeks. From Wikipedia: [The major theme of the song], "'the day the music died' refers to the plane crash in 1959 which killed early rock and roll performers Buddy Holly, The Big Bopper, and Ritchie Valens. (The crash was not known by that name until after McLean's song became a hit.) The meaning of the other lyrics has long been debated, and for decades, McLean declined to explain the symbolism behind the many characters and events mentioned. However, the overall theme of the song is the loss of innocence of the early rock and roll generation as symbolized by the plane crash which claimed the lives of three of its heroes." Hat Tip: to my older brother Sandy for this great video from Quesou Tontus on You Tube that not only explains [in my opinion very accurately] the meaning of the words of American Pie, but also has great pictures and video that brings back nostalgic memories from those growing up in the 60's and 70's. Bravo for this awesome video that brings back many memories and many tears.